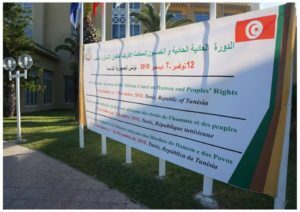 TUNIS, Tunisia – On Friday, 7 December 2018, the African Court on Human and Peoples’ Rights (AfCHPR) commenced its 51st Ordinary Session in Tunis, Tunisia. During the 51st Ordinary Session, the court rendered four judgements. African Court of Human and Peoples’ Rights 51st Ordinary Session in Tunis, Tunisia. Photo Courtesy of AfCHPR. In the first matter, Ingabire Victoire Umuhoze was originally sentenced to eight years in prison for allegedly propagating ideologies of genocide and terrorism against the Republic of Rwanda. On appeal her sentence was increased by fifteen years. In 2014, Umuhoze applied to AfCHPR alleging that the government violated her rights. In 2017, the court ruled in favor of Umuhoze. They then ordered the government to restore her rights and delayed a decision on reparations. In the 51st Ordinary Session, the court dismissed Umuhoze’s request for an expunged record but ordered the Rwandan government to pay a total of 65,230,000 Rwandese Francs to Umuhoze and her family for material and moral prejudice suffered. In the case of Armand Guehi v. United Republic of Tanzania, the court considered several allegations that during Guehi’s domestic proceedings the United Republic of Tanzania violated his rights under the African Charter on Human and Peoples’ Rights. Guehi alleged that the government deprived his right to a fair trial by not providing access to an attorney or a translator. Guehi alleged that he was in custody for an unreasonable amount of time and held in poor conditions. The African Court found that the United Republic of Tanzania violated the Charter in regards to the condition during Guehi’s custody and dismissed the other allegations. The court ordered the government to pay Guehi reparations amounting to $2,500 USD. In the third matter, Wereme Wangoko appealed to the African Court alleging the United Republic of Tanzania violated the applicant’s right to equity, equal protection under the law, non discrimination, and a fair trial under the African Charter. The court made a decision on the merits after dismissing the government’s objections for jurisdiction and admissibility. The court found that the United Republic of Tanzania did not violate any articles of the African Charter. In the case of Mgosi Mwita v. United Republic of Tanzania, the court ruled that the government had violated Mwita’s right to equality and equal protection under the law. The United Republic of Tanzania was ordered to release Mwita from prison and to provide him with copies of his court documents. Additionally, the court allowed Mwita thirty days to file for reparations against the government. In addition to the four judgements, AfCHPR recently announced that in 2019 they would be implementing reforms. These reforms would focus on modernizing the court’s workflow and case management as well as a new organization of internal methods and court procedures. Additionally, African Court President stated that AfCHPR would work to strengthen cooperation with the States, stakeholders, academia and other regional courts. AfCHPR meets during Ordinary Sessions four times a year. They will convene for their 52nd Ordinary Session in 2019. As of November 2018, the court has received 190 applications and has finalized 48 of their cases.